Colleges and universities implementing the Salesforce platform have a wealth of options for building a system that supports every department on campus. If you’ve found your way to this blog post, you’ve probably already heard about the Higher Education Data Architecture (HEDA), but here’s a quick refresher in case you haven’t. 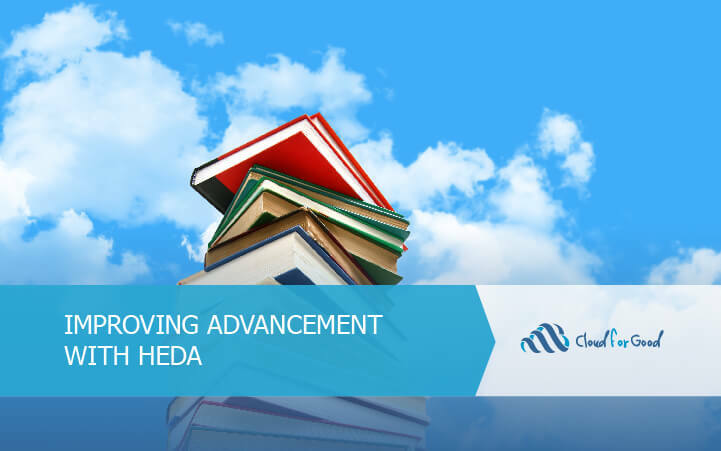 HEDA provides a baseline architecture for your college or university on Salesforce, with the ability to manage students with their program enrollments, course details, and departmental affiliations. This framework allows you to get started on the platform with the flexibility to further customize your Salesforce instance to suit your college’s specific needs. Because HEDA is intended to be a data architecture and not a comprehensive product, it doesn’t cover all ranges of functionality that a college may hope for from their CRM. For example, there isn’t any functionality specifically for the advancement department included in HEDA, but there is space in the system to add all of the features that an advancement department might need. Many organizations who what to manage advancement or fundraising on the Salesforce platform opt to use the Nonprofit Success Pack (NPSP). Unfortunately, it isn’t recommended to install both HEDA and the NPSP into the same Salesforce instance, because some of the custom architecture from each package will conflict with the other. For instance, both packages have their own approach to the Account model, with NPSP favoring Household Accounts, and HEDA favoring individual Administrative Accounts for each student contact. This means that it is important to decide at the beginning of your Salesforce implementation which architecture you want to use. NPSP will have more built-in fundraising functionality to get you started, but HEDA has the advantage of built-in support for the student lifecycle and integrations with AppExchange vendors offering additional extensions for higher education. If your advancement department is one of the main stakeholders for your Salesforce implementation, it can be difficult to choose between HEDA and the NPSP. HEDA with additional customizations for Advancement functionality may be the right choice for you if you envision Salesforce becoming the central engagement hub on your campus for managing relationships with students, alumni, and their families. If you want to be able to run one central CRM for the entire campus, instead of separate instances for different functional areas, then HEDA is probably the best place to start. Furthermore, if your college is interested in implementing future developments on the HEDA platform such as AdvisorLink, then you’ll be best served by customizing HEDA to suit your advancement needs. ning with HEDA, can prompt you to take action on major gifts and make sure nothing falls through the cracks. Standard Contact Roles on Opportunities can help you track donors and individuals who influenced a gift. The Relationships and Affiliations objects included in HEDA can be useful for managing donor and alumni relationships and connections as well. Adding roll-up summaries of Opportunity data to the Account can give a snapshot of a donor’s gifts for the current year or over their lifetime. In addition to all of this functionality available out of the Cloud for Good Fundraising package can be added to HEDA to provide additional support for common advancement use cases, such as major gift and grants management, designations and allocations, interest and preference management, badges, and other related customizations to the Contact, Account, and Opportunity objects to better support your advancement team members. Additional integrated applications can be added to your HEDA Salesforce instance to expand your functionality for Advancement. You can bring in additional information about your prospects and donors’ wealth, capacity, and networks via tools like WealthEngine or RelSci. For online donation pages, events, and peer to peer fundraising, there are numerous options available, including Classy, Click & Pledge, or iDonate. If you need to generate acknowledgement letters, a mail merge tool such as Conga Composer, Drawloop, or Apsona can fulfill this needs. The wide range of applications available on the AppExchange allow you to tailor your HEDA Salesforce instance with custom functionality to support your advancement department’s specific needs. HEDA doesn’t have built-in functionality for advancement, but it serves as a great foundation to leverage native Salesforce functionality and additional apps to bring your advancement department onto the platform. Your college can keep everything in Salesforce as a centralized engagement hub, smoothing the journey from prospects and students to alumni, donors, and supporters. We have two upcoming webinars covering HEDA. On Wednesday, April 5, 2017 at 2:00 pm EDT, join Corey Snow of Harvard University and Cloud for Good as we dive into when you may want to utilize HEDA, when NPSP may be the right option for you and learn more about governance of multiple Salesforce orgs. Register here. On May 4, 2017 at 2:00 pm EDT, join us to learn more about HEDA and fundraising. See HEDA in action and learn how to maximize your fundraising efforts. Register here.